Blastdanation™ chronicles the celebrities, Un-Signed Artist, Major Celebrities, sounds, fashion, lifestyle, new media, and business. 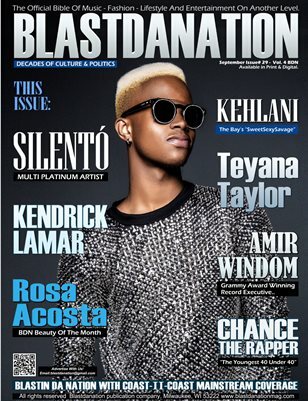 Upcoming Sept. Print issue of Blastdanation Magazine, with The "SILENTO" gracing the cover of BDN and much more. Get ready for one of the best issues of 2017. Available Now! OUT NOW, Past issues online.. All major actors/artist always igracing the cover of Blastdanation Mag. We ship "On Demand", 4 colors available.. Contact Press, Reporters and staff. Engaging readers with award-winning editorial and alluring content inprint and on the web. Blastdanation Magazine is the No. 1 “Culture Wave” brand in the country, providing notable results for our advertisers. Advertise With Us! of the month, check out her layout in September's issue. We’ve heard the song; we’ve done the dance. We’ve watched the video on YouTube, along with 1,330,000,000 other people. Silento’s “Watch Me (Whip/Nae Nae)” was a global sensation. Check out his full double page article in BDN.